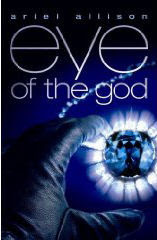 Welcome to Married Life: Book: eye of the god *and giveaway! Ariel Allison is a published author who lives in a small Texas town with her husband and three young sons. She is the co-author of Daddy Do You Love Me: a Daughter’s Journey of Faith and Restoration (New Leaf Press, 2006). Justin Case, the first of three children’s books will be published by Harvest House in June 2009. Ariel is a weekly contributor to www.ChristianDevotions.us and has written for Today’s Christian Woman. She ponders on life as a mother of all boys at www.themoabclub.blogspot.com and on her thoughts as a redeemed dreamer at www.arielallison.blogspot.com. I am the daughter of an acclaimed and eccentric artist, and given my “unconventional” childhood, had ample time to explore the intricacies of story telling. I was raised at the top of the Rocky Mountains with no running water or electricity (think Laura Ingles meets the Hippie Movement), and lived out the books I read while running barefoot through the sagebrush. My mother read to me by the light of a kerosene lantern for well over a decade, long after I could devour an entire novel in the course of a day. Authors such as C.S. Lewis, J.R.R. Tolkein, George MacDonald, and L.M. Montgomery were the first to capture my heart and I have grown to love many others since. The story is told in modern context with Abby retelling the history of the jewel in flashbacks. It's quite interesting this way and breaks up the suspenseful parts so it's not quite as strong yet also keeps you reading to find out what will happen! I find this to be a very well written book! Giveaway! For some reason the publisher sent me two copies of this book so I have one to give away! Leave me a comment, what do you know about the Hope Diamond, do you like jewelry heist stories, a la Oceans Eleven? I'll pick one person some time next week and you'll get the second (unopened!) copy! To tell the truth, I don't know much about the Hope Diamond, but I do like suspenseful reads. This book sounds very interesting and I would be grateful to win it. Thanks for the chance. well, I know the Hope diamond is really big and really expensive and I'm sure it has a fascinating history. I'd love to read it! All I know about the Hope diamond is that many people think that there is a curse attached to owning it -- since its owners tend to die. I love reading a good thriller from time to time -- and this sounds like it would hold my attention.